It was the summer of 1993 when I first experienced church camp. I had grown up camping with my family on the shores of Lake Leelanau in northern Michigan and had camped with my Boy Scout troop in central Ohio, but never before had I attended church camp. To be honest, I had always thought that church camp was for church nerds; for those who did not fit in elsewhere, so needed a place to go and a camp to call their own. I never thought the day would come when I would consider myself a part of that group. I never thought that church camp would become such an integral part of my identity and sense of call. That summer, before my junior year in high school, I had been wondering what to do with my life. Where would I go to college? What would be my major? How would I make a difference in the world? I went into the summer seeking clarity; seeking a calling. I wanted to help people – I knew that – but I did not know how. And so, I begrudgingly accepted an invitation to come and help out at church camp. On a dare of sorts I decided to give it a shot. If nothing else, it seemed like a good place to get clarity on what was next for me. Camp seemed like a safe place to explore my options. 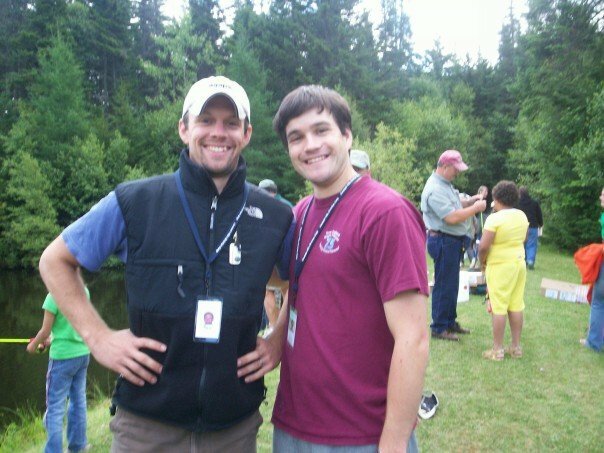 Before helping campers learn to fish, Ken and a counselor at Camp Agape in Vermont smile for a photo during the summer of 2007. 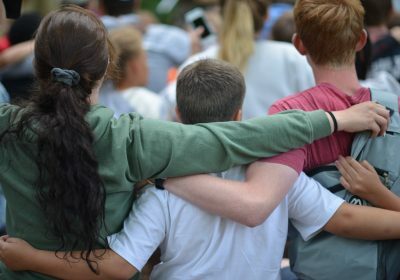 There at Procter Summer Camp in the Episcopal Diocese of Southern Ohio, I learned that church camp is indeed for those of us who do not fit in. That was and is part of the beauty of church camp; that all are included, all are loved, all are made to feel safe and special. Never before had I experienced God, Christian community, or my own sense of calling like this. At that moment it became clear to me that I was made for this kind of community. To “make a difference in the world” now meant working towards creating and sustaining such sacred and special places. I was being called into the community of the Church. My calling came at camp, and camp became part of my calling. In the summer of 2002 I returned to Procter Summer Camp, this time not as a counselor but as the chaplain for Senior High week. Earlier that summer I had graduated from The General Theological Seminary in Manhattan and was ordained a priest in the Diocese of Southern Ohio. Now I had the opportunity to return to that sacred and special place that had formed my faith. Now I had the chance to serve the young people in my diocese by helping to create a camping experience like my own; one of inclusion, love, and safety. I was excited by the opportunity to give back and to make a difference in the lives of these young people. What I did not anticipate that summer was how I would once again be profoundly changed by that place and those people. I entered camp that year with the hope of giving back and making a difference. Little did I know at the time that I would be the one to receive so very much from the campers, counselors, and staff; that they would in fact be giving to me and once again making a difference in my life. Between my own personal transformation and witnessing firsthand the many transformational experiences of campers and counselors alike, I became convinced that church camp is like few, if any, other places in the world. It reinforced to me that camp and camp ministry would forever be a part of my calling. For five years I continued to serve as chaplain for Senior High week at Procter Summer Camp. When my family and I moved from Ohio to Vermont, I continued my chaplain ministry at Rock Point Summer Camp in the Episcopal Diocese of Vermont. Though the place and the people changed, the inclusive, loving, safe and special nature of church camp did not. In Vermont, the least “churched” state in the country, where Christians are in the minority, Rock Point Summer Camp was a safe space for young people to wrestle with their faith and to support one another. Also while in Vermont, I served as chaplain for an ecumenical camp called Camp Agape, a camp for young people who have one or both parents incarcerated in the Vermont prison system. Many of these young people had experienced violence, instability, and great loss at an early age, and came to camp thinking that was how the world worked. In contrast, at Camp Agape we shared with them the power of God’s unconditional love; God’s “agape” love. 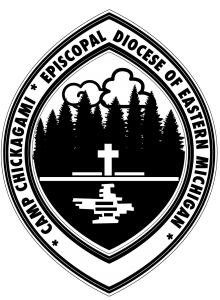 This summer, fifteen years since first serving as a church camp chaplain, I had the opportunity to work with the Counselors-In-Training at our own Camp Chickagami. That first evening of camp we were late arrivals, having gotten turned around in the northernmost reaches of the mitten, where cell phone signal and GPS are spotty at best. Joining the group and sitting towards the back, we watched a series of skits and then were welcomed into the dancing and singing of silly songs. My teenage daughter soon shot me the “please, get me out of here” look. Her younger sister was more engaged, but still thought all this singing and dancing was “weird”. It looked like the first signs of transformation and the formation of community. Though my first time ever at Camp Chick, it did not take long for that sacred and special place to feel like home, and for those kind and compassionate people to feel like family. 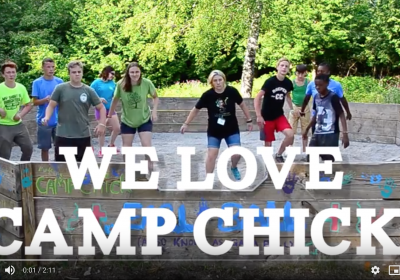 Though my daughters and I were brand new to Camp Chick, we together shared that same extraordinary community I first experienced in the summer of 1993; being welcomed into a place apart that was and is inclusive, loving, and safe. We saw firsthand the power of Spirit-filled, Christian community at play. At the end of the week, my daughters and I began our long drive home. Both girls were quiet, sad that we were leaving. 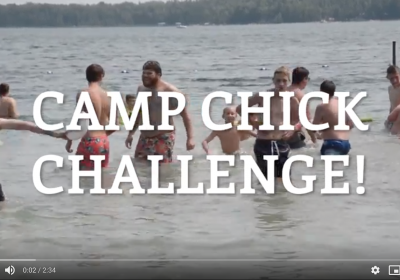 Soon they started to share their respective camp stories – the fun time at the falls, their favorite songs from chapel, how they would miss all of their new friends – and laughter filled the car. For both of them, it was the highlight of their summer, and their time closest to God. When I reflect on my church camp experiences, and now those of my daughters, I think about how often camp can lead to a sense of calling, and how often our being called is an experience of transformation, both for ourselves and for others. Indeed, the story of Camp Chick itself is one of transformation. The boys’ camp began in 1929 and was shut down and merged with the girls’ camp in Ortonville in the 1980s. It sat unused for years until a small band of loving and dedicated people brought it back to life, making it ready and open for families and organizations to rent out throughout the summer. A diocesan summer camp began offering one week of programming per year. It grew to two. It grew to four. It grew to six weeks and eight different program offerings – arguably the most racially, economically, and generationally diverse worshipping community in the diocese. Today, Camp Chickagami is emerging with new life and energy in the midst of a world in which we’re told the church is dying. A true story of call and of transformation. However, it is not without very real challenges. If we are going to continue to provide an inclusive, loving, and sacred place along Lake Esau for generations to come, a place where young people like me and like my daughters can experience God’s love and sense of call to ministry, it is going to require investment – investment of time, investment of resources, and investment of prayer. I hope that we are up to the task. The Rev. Ken Hitch is rector of St. John’s Episcopal Church in Midland. He and his family enjoy camping – even apart from Camp Chick – and exploring our beautiful state in their travel trailer, “Bernie”.